Where there is football, there is usually beer. 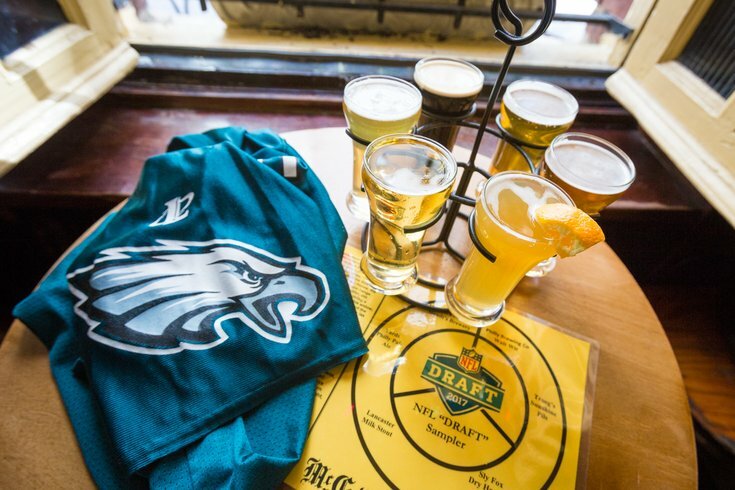 The NFL 'Draft' Sampler features six 6-ounce beers from the Philadelphia region. It will be available during the NFL Draft weekend in Philly. As we inch closer to the weekend of the NFL Draft Experience in Philadelphia, there's plenty to get excited over (although, maybe not the road closures and parking restrictions through April). From April 27-29, the free outdoor football festival will provide fans with interactive exhibits, games, virtual reality experiences and other activities. Plus, some lucky fans will win tickets into the actual NFL draft. An estimated 200,000 people are expected to attend the weekend-long event on the Benjamin Franklin Parkway. Those who venture off from the main attraction, or want to avoid the large crowds on the Parkway, can stop into McGillin's Olde Ale House beginning April 27 for a different kind of "draft" experience. The 'Game Day Shandy' (left) was made for day drinking, while the 'Philly Tailgate' reminds us we all win when the booze is good. 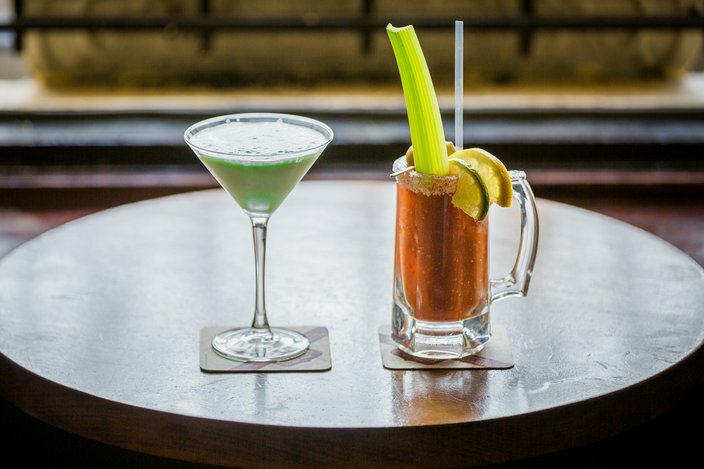 The historic bar will offer beer and cocktail specials, inspired by the NFL draft in Philadelphia. • Game Day Shandy – The shandy is made with Philly Brewing’s Walt Wit, lemon soda, watermelon liquor and lemonade. • The Philly Tailgate – It's essentially a re-named Citywide Special. Can't go wrong with Jim Beam and PBR. • NFL Fanatic – Vanilla vodka, Creme de Cocoa and Creme de Menthe liquors are used for this sweet concoction. • The Iggletini – According to McGillin's, this martini's name inspiration come from how Philadelphians pronounce Eagles. • Hail Mary Bloody Mary – The breakfast of champions. Prove Philly is a classy city by opting for the The Iggletini (left) over a beer. If it's before noon, try the Hail Mary Bloody Mary. As for beer, a NFL "Draft" Sampler will be available, featuring six 6-ounce beers. The sampler includes brews from Yards, Philly Brewing, Troegs, Sly Fox, Stoudt’s and Lancaster Brewing. 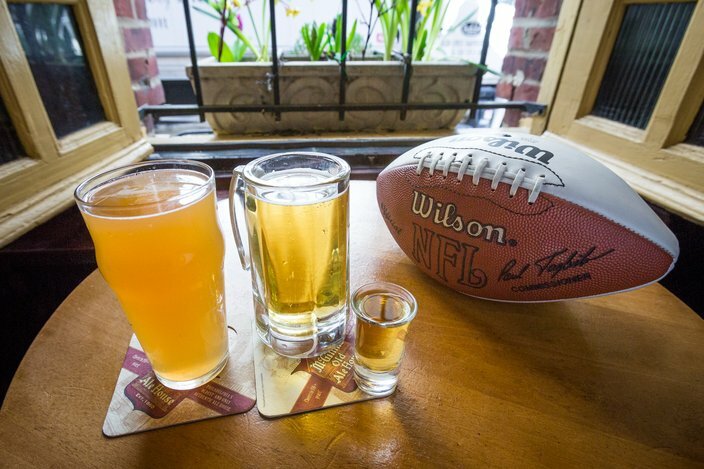 If you have a McGillin’s SuperMug at home, make sure to bring it to the bar for $1 Bud Lights during the NFL draft.